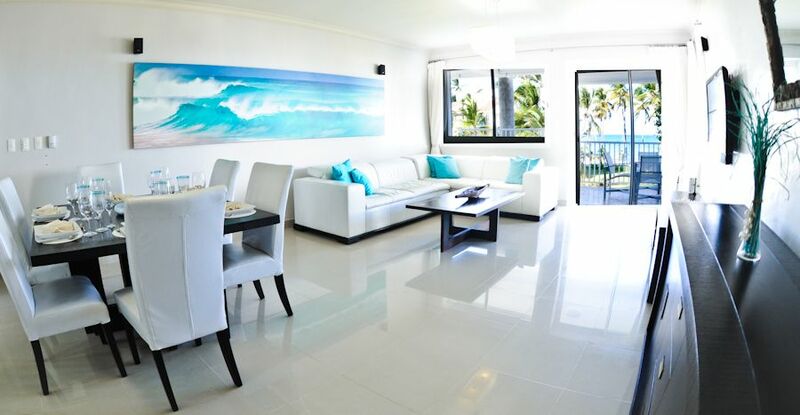 Located on a beautiful private beach, with white sands and turquoise waters! This luxurious, comfortable and fully equipped condo, has stunning views! Condo includes: 3 bedrooms, 3 bathrooms, service quarters with laundry room, Air Conditioner in each room, ceiling fans in each bedroom, flat screen TV in the living room, accomadates 6 adults comfortably. Top quality materials and finishing. Cleaning lady included every other day! Complex Includes: 24/7 security gate and personnel, Two communal pools, kids pools, reception area, elevators, shaded pergola at beach, pool bar (which also services the Beach area), free wi-fi internet. No car needed, as Condo complex is located close to all amenities. Within a 5 minute walk you will find grocery stores, bakery, pharmacy, spas, bars, restaurants, shopping and ATM machines. Punta Cana airport is only a 20 minute drive and transportation to and from the airport can be arranged! Six of us stayed at Playa Turquesa in a very nice unit with great views of the ocean. Unit J302 was perfect for 6 adults with 3 bedrooms and 3 bathrooms. Ilia did a great job arranging our pick up from the airport and return on the day we left. Nice grocery store with all of our needs basically on the grounds. At least a dozen nice places to eat and drink within two blocks. Some nice places on the beach as well within walking distance with one of the best right on property. Would stay here again and would recommend for adults like our group or a family. We stayed 12 nights and still didn't do all we wanted to do! The unit is a perfect location to pool and beach. We had 6 people in our group ages ranging from 13-59 and the space was perfect for our size. We chartered a boat from Gone Fishing and Scott caught a White Marlin which will be hanging in his office soon! We used Flintstones Buggy Adventure for buggy rides through the outback of DR, another fun excursion. We also chartered a pontoon w/slide with Wanna Boats for the day and enjoyed fishing (my 13 year old son caught a two foot Barracuda), tubing and swimming. All these companies were great and efficient and found via Tripadvisor. Excursions we booked from a guy on the beach in front of our resort when we got to DR were parasailing and Saona Island. We spent a day at Pearl Beach Club which was an amazing beach ($$$). No complaints or concerns with any of these. Enjoy and you will be thankful for the memories made! The condo is first rate and The ocean views along with the wonderful breezes made this the perfect get away for us sun starved Minnesotans. Illa was so easy to work with and her maid Mary was wonderful and illa's arrangements for taxi to and from the airport made travel days so much easier.! Would definitely stay here again.! Thank you so much for your review. Glad you had a great time with us. You are welcome to stay any time!! We stayed in this condo for 10 days, and it was a home away from home. It was immaculate and all our needs were met. Lia was great to answer any questions immediately and made things easy. Mary cleaned and Pedro picked us up at the airport and took us back. The weather was just beautiful. We took some jackets but did not need them. We would definitely go back. Thank you so much for your review. we are very happy you had a great time and we are thrilled to have you back in the future!! We were looking for a family vacation destination without the need for several hotel rooms. This condo was ideal in that it provided lots of living space to spread out including a huge and comfortable patio with awesome ocean views. Lia was very easy to communicate with prior to and during our stay and arranged transportation to and from the airport. Although we stopped at Jumbo Supermarket on the way to the condo, we could have found everything we needed at one of the two smaller markets within a short walk of the condo. There are also plenty of restaurants within a short walk of the complex and we also frequented TOC Restaurant /Bar on the property's beach. All in all a very lovely condo and vacation experience. Thank you Lia. Thank you so much for choosing us for your vacation !! we are glad you had a great time and hope to have you back ! We enjoyed this beautiful spacious 4 bedroom ocean front condo. There is an attention to detail and the property is beautiful. Thank you so much for taking the time to writing a review of us. Hope to have you back soon.